Video above, posted on YouTube by Ahmad 770, focuses on Nation of Islam Minister Louis Farrakhan’s remarks in Detroit Sun. Oct. 14 regarding Dr. Christine Blasey Ford and her testimony against newly confirmed U.S. Supreme Court Justice Brett Kavanagh, condemning both the sexual abuse of women and little boys, including that by Catholic priests. Minister Farrakhan also spoke of his meeting with R. Kelly, calling for forgiveness when it is warranted. He touched on the role African religion played in the establishment of the first Black republic by Toussaint L’Overture. Student Minister Troy Muhummad, of Mosque #1 in Detroit, chaired the rally Oct. 14. Members of that Mosque prepared the way for the rally. In solidarity with victims of mass incarceration, he recalled that he himself was in prison at the time of the Million Man March. As editor of the Voice of Detroit, I was honored to be escorted to the press gallery by a young Muslim sister, herself an aspiring journalist, to cover Nation of Islam Minister Louis Farrakhan’s appearance at the Aretha Franklin Amphitheatre on Detroit’s riverfront Oct. 14, 2018. 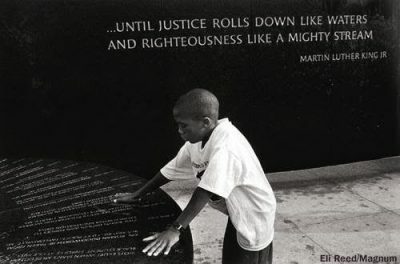 The event was the commemoration of the 23rd anniversary of the Million Man March on Washington, D.C. Oct. 16, 1995. That March brought out over tw0 million Black men to assert their presence and power, while corporate America’s assault on Detroit, Flint and other Black-majority cities, and that of mass incarceration and police murders, particularly of people of color, was exploding across the nation. As Detroit undergoes the ravages of a renewed white supremacist takeover, it was truly uplifting to hear the Honorable Minister Louis Farrakhan’s words, and watch as they brought renewed hope to Detroit’s majority population listening in the audience and on livestream nationwide. DETROIT – Members of the Nation of Islam and hundreds of others, primarily of African descent, filled the seats of the newly-named Aretha Franklin Amphitheatre in Detroit Oct. 14, drinking in the words of Minister Louis Farrakhan as he commemorated the twenty-third anniversary of the Million Man March. Minister Farrakhan’s talk held out hope for the future of the people of this majority-Black city, suffering from the ravages of white supremacy on the ascent. “We are honored the speak to the people of Detroit, particularly the Black and the Brown, who have lived under tyranny and oppression ever since we set the soles of our feet in the wilderness of North America, and our people have suffered greatly every day, about 463 years of sojourn in America,” Min. Farrakhan declared. 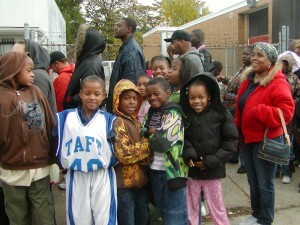 Detroit children wait in line Sept. 1, 2012 for winter coats provided by the Moorish Science Temple of America #25. During his talk Oct. 14, Min. Farrakhan welcomed the presence of Moors in the audience. 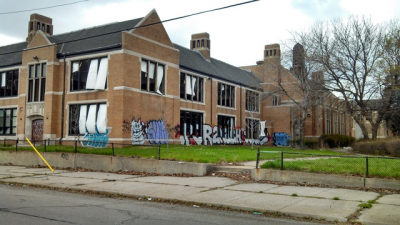 Currently, sixty percent of Detroit’s children live in poverty and the majority of the city’s public schools, which once produced great Black leaders, have been closed. Tens of thousands of the city’s youth are being shunted through the school-to-prison pipeline. Detroit’s once proud neighborhoods of working-class homes, mostly occupied in recent decades by Black families drawn north to jobs in the auto industry, have been devastated by mortgage and tax foreclosures. They have either been left to rot or auctioned off to a majority of white bidders at government-sponsored auctions, reminiscent of the auctions of kidnapped Africans during another era. After the largest major city bankruptcy in history, a fraudulent result of the city’s takeover by a state-appointed emergency manager, Detroiters no longer own or control city assets such as the Detroit Water and Sewerage Department, which once provided clean water for 40 percent of Michigan residents, or the beautiful Belle Isle Park, which formed a backdrop for the Minister’s talk in the riverfront theater. Former Detroit Water and Sewerage Dept. worker Derek Grigsby and family participate in protest against phony Chapter 9 Detroit bankruptcy of 2014, which left the city 300 percent more in debt. Min. Farrakhan offered a lengthy and stirring tribute to Detroit’s Queen of Soul, Aretha Franklin, who passed August 16, 2018, and was honored world-wide. Her funeral at Greater Grace Temple in Detroit, pastored by the Rev. Charles Ellis, brought out the greatest stars of African-American music and many more. 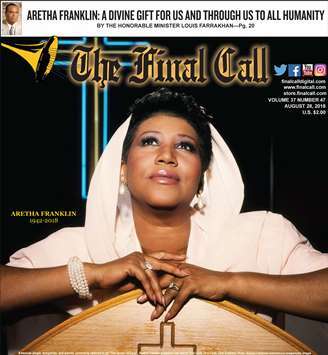 Aretha Franklin was honored on the front page of The Final Call after her death. Min. Farrakhan recalled that Ms. Franklin was not only a singer, but a political activist who loved her people and never forgot her roots in Detroit, as the daughter of Pastor C.L. Franklin of New Bethel Baptist Church, and part of a musical legacy born here. He also had pithy remarks for certain leaders (including former U.S. President Bill Clinton), who unashamedly ogled young singer Ariana Grande, sitting behind her on the stage. Grande was one of dozens of world-renowned Black singers and musicians who performed at Ms. Franklin’s funeral. He said Ms. Franklin came to New York City in 1972 to stand with the Nation when its Mosque in New York City was attacked by the police. “Abdul Akbar Muhammad, international representative of Minister Farrakhan and the Nation of Islam had fond memories of Aretha Franklin, though he only met her up close once. That was after she visited the historic Muhammad Mosque No. 7 on 116th Street and Lennox Avenue, now Malcolm X Boulevard, in April 1972. While under the leadership of Min. Farrakhan, Mosque No. 7 was attacked by police officers responding to a false emergency call. One officer was killed by another officer’s weapon. 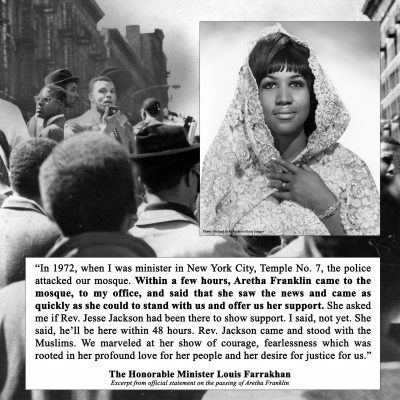 Photo published by The FInal Call honors Aretha Franklin’s stand with the NOI when the NYPD attacked Mosque #7 in New York City in 1972. 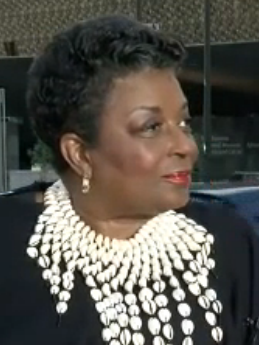 “I love being here in Aretha Franklin Amphitheatre,” Min. Farrakhan said. “We loved her singing and her soul. . .I met her in 1972 when police attacked our Mosque in New York. I was on television ordering all white people out of Harlem. Min. Farrakhan continued, “Like most of our Black artists, particularly females, you don’t have good men. I’m sorry, brothers, we don’t know how to handle women that are intelligent, that are go-getters, that are young, gifted and black. So most of our female artists have never had men in their lives that they could look up to with honor, deep and abiding respect, and profound love. . . My dear sisters, when you fall in love and you think that the handsome man who’s muscular and strong-looking, but weak-minded. I had never seen Fantasia up close, so this was my opportunity at Aretha’s homegoing. I happened to go in the back and there she was with her husband. She said, minister, I’m so nervous, cause I’ve got to sing one of Aretha’s songs. I told her, don’t be nervous, just get inside the word and everything will be all right. Min. Farrakhan segued from those observations to a truly stunning statement of solidarity with Dr. Christine Blasey-Ford, citing her courage in standing up to expose the wrongdoing of now U.S. Supreme Court Justice Brett Kavanaugh. In doing so, he expressed support for all women of every color who have been abused by men in the white supremacist patriarchy that is the United States. Women all over the world who were appalled and galvanized by Dr. Blasey-Ford’s testimony should now know that they have common ground with the men and women of the Nation of Islam. Hopefully they will take the hand that Min. 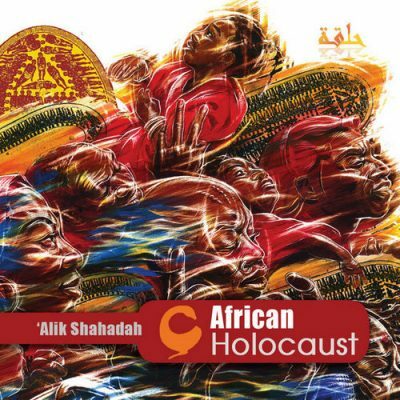 Farrakhan extended to them in order to create a strong movement against the continued rise of white supremacy in the U.S. At its core it is based on the white man’s belief that he owns everyone and everything, from 2.2 million people, mostly Black, incarcerated in the largest penal system in the world, to women and children of all races and nationalities. Dr. Christine Blasey-Ford testifies before the Senate Judiciary Committee about Brett Kavanaugh’s sexual assault on her. She said her family has had to go into hiding because of repeated death threats. “I want to go right to Ms. Blasey Ford, and Judge Kavanaugh, now Justice Kavanaugh. In this world, and in human life, people outgrow bad habits, bad deeds, and change their lives. . . .So if Judge Kavanaugh bothered Ms. Ford when she was 15 and he was 17. Min. Farrakhan did express his long-held belief against the practice of abortion, but for the Black community, this is a complex issue. Tens of thousands of women of color across the world have been victims of forced sterilization at the hands of the white oppressor, who seeks to stem the influx of more people of color into the world. 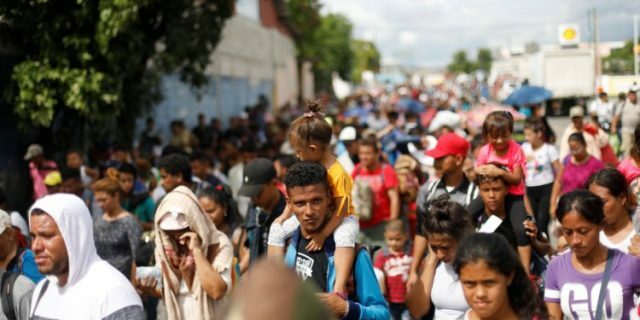 In addition to forced sterilization, the history of European conquests of other nations is replete with horrific accounts of mass genocide against the native peoples of the Western Hemisphere, as well as the African Holocaust. In current times, however, a startling reversal is taking place, says a report on uk.sci.med.nursing, a Google discussion forum. Lifelong union and community activist Eula Powell at 80th birthday party, 2017. VOD editor Diane Bukowski: I met my long-time friend Eula Powell (l) a community activist and union leader from the historic UAW Local 3 (Dodge Main) when we were working with a coalition of my union Local AFSCME 457 and hers to save Detroit General Hospital and Dodge Main from 1977 to 1980. We were elated to find ourselves at this gathering Sat. Oct. 13, 2018, on the eve of Min. Louis Farrakhan’s appearance in Detroit described above. We went to Bert’s to get dinner, but ended up meeting the illustrious Askia Muhammad, Sr. Editor of the Final Call, and his wife Alverda Muhammad, as well as the Final Call’s National Correspondent Charlene Muhammad. Bert Dearing himself welcomed us to the private gathering. 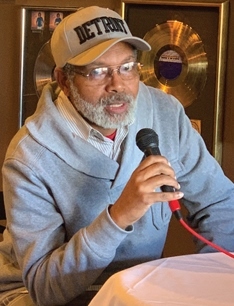 Voice of Detroit earlier covered his battle to maintain ownership of that property in the face of Caucasian gentrification of Eastern Market, downtown Detroit, and the Cass Corridor (now called “Mid-City”). 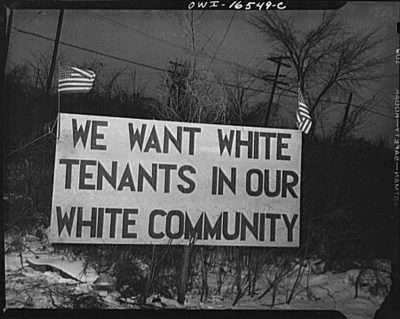 It has now extended to homes of Black families in the North End, stolen from them and handed over to white occupants at government-sponsored tax and mortgage auctions, and to the eastern Riverfront to landmark apartment buildings like the Jeffersonian, where African-American seniors and others who have lived there for decades are being displaced by its new owners, Joe Barbat of Barbat Holdings, and Arie Liebowicz. 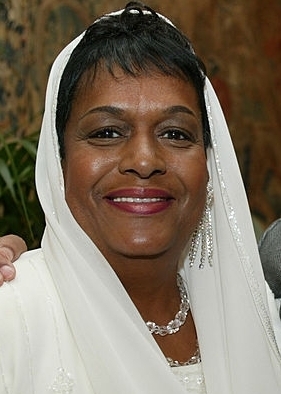 DETROIT—Alverda Muhammad, a Nation of Islam pioneer from Muhammad Mosque No. 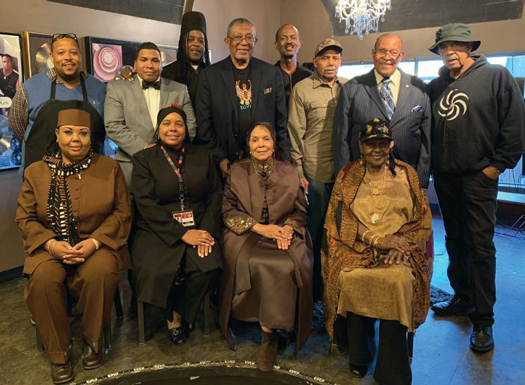 4 in Washington, D.C., facilitated a riveting dialogue with men and women who journeyed to the historic 1995 Million Man March called by the Honorable Minister Louis Farrakhan. They detailed how the march and subsequent commemorations, including the Million Family March and the Millions More Movement, have touched their lives. 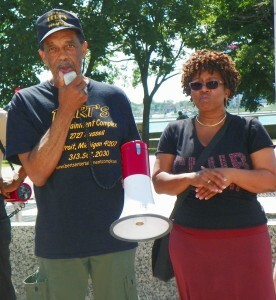 Bert Dearing speaks at downtown Detroit rally to save Black businesses July 21, 2015. Bert Dearing, owner of Bert’s Entertainment Complex, hosted the Muslims and their guests in his bistro on October 13. His grandfather and Minister Farrakhan were very good friends, he told the rapt audience. “The Million Man March to me was very, very important because I was able to take my father, my two sons,” Mr. Dearing stated. In fact, they took a whole busload of men to the march, he said. “Just the bonding with my father and my two sons was more important than anything else, and then getting to Washington, D.C., on the bus, just talking or whatever, the energy, the power that you get being with Black folks, is something that you can never describe, but it’s once in a lifetime,” he said. 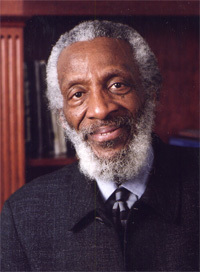 Malik Rahim took time off as an educator to attend the Million Man March. He drove with five others. People needed to hear Minister Farrakhan at that time, because the world and Blacks in particular were in a whirlwind, he said. “We lost the structure of our families, but the speech that he gave … helping your community, just seeing all our people there, the brothers, some of the sisters, it was like a big family, like being at home,” said Mr. Rahim. They returned home from the Million Man March with plans to develop a mentorship program for youth. “At that time our young people were into drugs, killing each other, getting expelled from school for 180 days, not going anywhere. They were just sitting at home,” said Mr. Rahim. The march participants worked and were effective in getting students facing drug charges authorization to still attend their special school, according to Mr. Rahim. “We taught them there, and they were able to pick up their grades. Those were the D and the E students, and they wound up being the B and the C students. Some were As,” he stated. That expanded to developing family services, coaching and academic programs, such as hosting Black engineers to speak to youth. Claudette Marie Muhammad, former national protocol director for Minister Farrakhan and the Nation of Islam, drew three rounds of rousing applause when she expressed many wonderful things resulting from the march that lifted women. First of all, there was the Nation of Islam’s First Lady Mother Khadijah Farrakhan and her daughters, Maria, Betsy Jean, Donna, Fatima and Khallada, and the First Lady of Washington, D.C., Cora Masters Barry, who coordinated the registration committee for the march. “We had Dr. Dorothy Irene Height, who was the mother of the Million Man March, and she did so much in bringing women all over the country,” Claudette Marie Muhammad stated. “Now, we didn’t come to the march per se, but the women did so much. 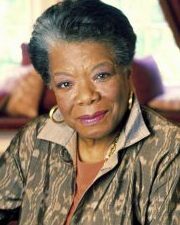 Dr. Betty Shabazz, Dr. Maya Angelou and I’m so very proud to announce that Dr. Angelou did a poem with words added by the Honorable Minister Louis Farrakhan,” she continued. Applause rang out again when she shared how her then 10-year-old granddaughter Tiffany recited the poem at the march. “The most thing I remember is I was like 45 and there were two buses, and they kind of separated the young guys on one bus and the elders on another bus, because they were playing music and games and all kinds of stuff the whole way up there,” he recalled, smiling broadly the whole time. He wanted to ride on Mr. Gregory’s bus and made his way during a bathroom break in the ride, he said. He was cleared to switch and that had a lasting impact on his life, he said. “I learned a lot about 40 Acres and A Mule, because I didn’t really know too much about it and everything, and how they were going there, and spoke to Congress; the meeting they were having with the president, the meeting they were having with Louis Farrakhan. I was able, since I switched buses, to slide in there and get to go to some of those little meetings and things, so it was a great experience for me,” Mr. Driver told The Final Call. Askia Muhammad in James Brady White House briefing room. 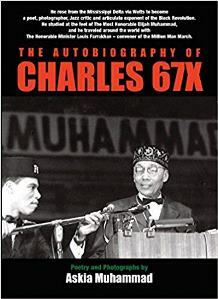 Diane Bukowski: I was most honored to receive a signed copy of world-renowned photojournalist, writer and Final Call Sr. Editor Askia Muhammad’s most recent publication, “The Autobiography of Charles 67X,” which is the story of his own life in his original poetry, essays and photographs. He and his wife Alverda Muhammad graciously presented it to me at the conclusion of the event above. (I was not present for the actual speeches during this event, so I have excerpted Sister Charlene Muhammad’s article.) I went home that night and read the book from cover to cover. An excellent review of this extraordinary publication is at http://stylemagazine.com/news/2018/jan/11/autobiography-charles-67x-poetry-and-photographs-a/. DETROIT – Charles K.K. Lewis spoke out powerfully at the conclusion of his 36th juvenile lifer re-sentencing hearing in front of Wayne County Circuit Court Judge Qiana Lillard Sept. 28. Reviewing 42 years of his incarceration since his murder conviction at the age of 17, he declared the justice system in the U.S. has failed him and members of Black and poor communities across the country since its inception. 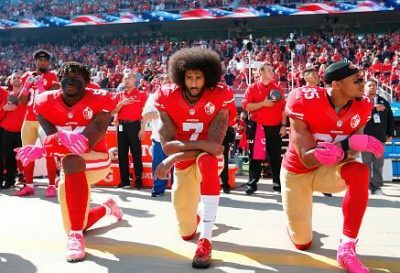 “This is the reason why you have guys like Colin Kaepernick taking a knee,” Lewis said, addressing the court on video from the Lakeland Correctional Facility. Lewis is one of 236 juvenile lifers in Michigan, 70 percent of them people of color, currently serving sentences outlawed by the U.S. Supreme Court in Miller v. Alabama (2012) and Montgomery v. Louisiana (2016). He is the first of the 236 still facing recommendations of new life terms to be heard in court. His re-sentencing hearing began in March, 2016. In an ongoing federal case, Hill v. Snyder, U.S. District Court Judge Mark Goldsmith appointed Attorney Deborah LaBelle as the official representative of the entire class of Michigan juvenile lifers, and also restored the use of “good time” credits to the class. State statutes enacted in 2014 (MCLA 769.25 and MCLA 769.25a) denied the use of these credits, which shorten time served, only to juvenile lifers in a discriminatory scheme. During the Sept. 28 hearing, Lewis’ attorney Sanford Schulman filed and argued multiple motions to dismiss his 1976 first-degree murder case and grant him bond pending re-sentencing. AP Thomas Dawson contended the majority of the motions were appropriate only as appellate motions for re-trial, rather than for re-sentencing. He said issues in them had already been addressed in previous appeals. However records of those appeals prior to 2000, including Lewis’ first appeal of right, are missing,as is the remainder of his case file from 1978 to 1999, so it is not known WHAT was argued in them. 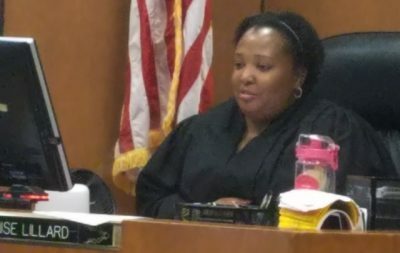 Judge Lillard then announced she will be on medical leave for the next two months and will issue her written opinions on the remaining motions on her return, hopefully in December. Lewis’ Register of Actions lists Dec. 7, 2018 at 9 a.m. as the date for his next post-conviction hearing. Judge Lillard told Attys. Schulman and Dawson, however, to continue the process of finding experts to testify at a mitigation hearing meanwhile. Lewis, an accomplished jailhouse lawyer who began studying law immediately after his incarceration, and now works in the law library at Lakeland, with access to LexisNexis, recounted the history of his conviction and his attempts to overturn it. Lewis’ first jury deliberated for three weeks in May, 1977 on charges that he killed off-duty Detroit police officer Gerald Sypitkowski July 31, 1976. Like most of his court file from 1976 through 1999, the complete transcript for that hearing is missing, along with his complete Register of Actions. That Register, deemed essential under Michigan court rules, currently begins with a notation that he was tried and convicted in front of Judge Gershwin Drain on April 3, 2000. 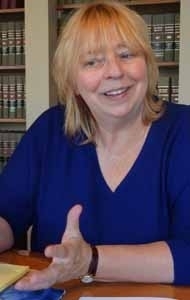 The last judge to review Lewis’ complete file, in 2006, Judge Deborah Thomas, said unequivocally that Recorder’s Court Judge Joseph Maher’s failure to specify on the record his reason for the jury dismissal in March, 1977, meant that Lewis should have been acquitted and subject to double jeopardy regarding any new trial. Lewis was re-tried twice anyway, once with a jury that was dismissed without cause when Maher took the case over from a Black visiting judge, and then with a jury whose names and racial composition were not recorded, which convicted him. The majority of testimony presented to that jury came from the officer’s partner and other eyewitnesses who identified a completely different perpetrator in a white Lincoln Mark IV. Another of Lewis’ motions regarded ineffective assistance of trial counsel, in which the trial counsel argued the defendant was guilty. Lewis’ court-appointed attorney, M. Arthur Arduin, was previously a campaign manager for Recorder’s Court Judge Thomas Poindexter, a leading advocate of keeping Black families out of white neighborhoods during the racially volatile ‘60’s and ‘70’s. Arduin ignored the testimony of the officer’s partner and other eyewitnesses in both his opening and closing arguments. He talked only about testimony given by three youths, ages 15 and 16, Mark Kennedy, Ronald Pettway, and who had been threatened with charges if they did not testify against Lewis. Schulman said that left open the possibility that Ewell would have re-sentenced Lewis to a term of years, not life without parole. Lewis supplemented his attorney’s statements with the judge’s permission. 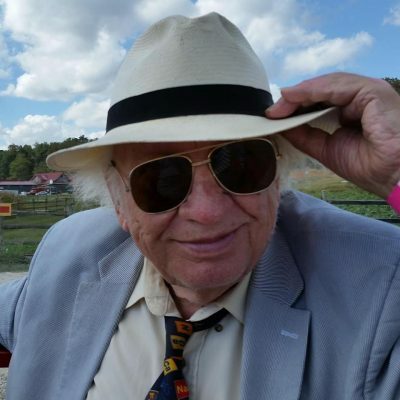 Key arguments toward the conclusion of the hearing dealt with the extraordinary loss of Lewis’ official case file and Register of Actions, and left open the possibility of some light at the end of the tunnel, with regard to converting Lewis’ sentence from LWOP to a term of years. He has already served 42 years. Schulman said the loss of the file also hinders his representation of his client. Charles Lewis at 17 with his mother Rosie Lewis. He was already in prison. Throughout his tenure in the MDOC, he has honed his extraordinary musical talents, leading many prison bands. Detroit Re-Entry Center on Ryan Rd. Asserting that everything in the Sept. 28 hearing had already been covered, AP Dawson had referred to the 1993 movie “Groundhog Day.” In it, actor Bill Murray plays a weatherman covering a Groundhog Day event, but then is caught in a time loop where the day keeps repeating itself over and over. 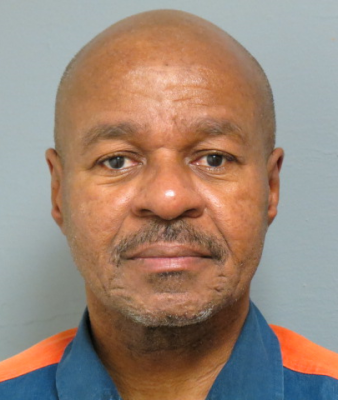 At the conclusion of the hearing, Judge Lillard again skirted the issue of having Lewis transferred to the Ryan Correctional Facility in Detroit, to facilitate visits from his attorney as well as any experts that may be called to a mitigation hearing. Judge Lillard told the attorneys to confer with Criminal Court Presiding Judge Timothy Kenny regarding the matter. Charles Lewis after obtaining culinary arts degree. In addition to its proximity, Ryan, now known as the Detroit Re-Entry Center, provides improved health care and food for the people held there, and also programming geared to help them re-enter society. Lewis, now 59, contracted diabetes while incarcerated and now suffers a severe case that is threatening his eyesight. He has also had three heart attacks in prison, with the MDOC refusing to provide him with a stent for the last one. In 42 years, he has gone from being an intelligent, musically-talented, and athletically-talented 17-year-old who took care of his four younger sisters and brothers, including his brother who is blind. His mother Rosie recalls how he took care of him, teaching him to ride the city buses and navigate his way around the world. Lewis went to both parochial and public schools and got good grades. He was about to graduate high school, and looked forward to college and a life sharing his talents with the world. 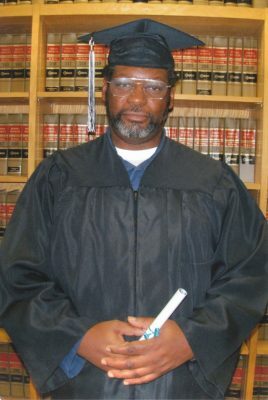 Since he has been in prison, he has obtained a paralegal certificate (he rated first on the test for paralegal training when he first took it at Jackson), and has used those skills both for himself and to help others with their cases. He also obtained a degree in culinary arts, among other accomplishments. 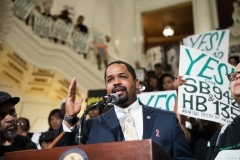 PA State Sen. Sharif Street speaks at rally for SB 942, to “end death by incarceration,” on Oct. 3, 2018. Aside from being the only country in the world that sentences children to life without parole, the U.S. is also the only country in the world that sentences adults to die in prison. Others allow prisoners to see the parole board for possible release within 10-15 years. Above, Debra Simmons came to court to support Charles Lewis. She said she is a member of Moratorium NOW! Above, Minister Reynolds X, long-time friend of Lewis and his family, speaks out against racist system of justice in U.S. CALL JUDGE QIANA LILLARD’S OFFICE AT 224-2391 AND ASK HER ASST. TO REGISTER YOUR SUPPORT FOR CHARLES K.K. LEWIS’ RELEASE. Motion to dismiss due to lack of court file: http://voiceofdetroit.net/wp-content/uploads/lewis.charles.mtn_.5.dismiss.file-1.pdf. 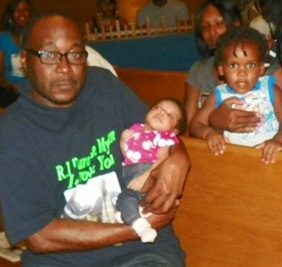 Motion to dismiss due to actual innocence: http://voiceofdetroit.net/wp-content/uploads/lewis.charles.mtn_.6.dismiss.actual.innocence.pdf. Motion to dismiss due to ineffective assistance of trial counsel: http://voiceofdetroit.net/wp-content/uploads/lewis.charles.mtn_.1.iac_.pdf . Charles Lewis objections to Judge Lillard’s order to reconstruct file http://voiceofdetroit.net/wp-content/uploads/C-Lewis-Objections-6-23-17.compressed-1-1.pdf. 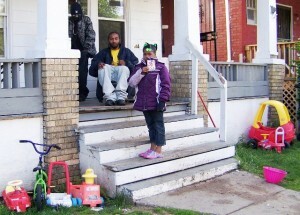 Victims of Detroit police task force teams: (L to r) Imam Luqman Abdullah, murdered in 2009; Aiyana Jones, 7, murdered in 2010, Terrance Kellom, 19, murdered in 2015. 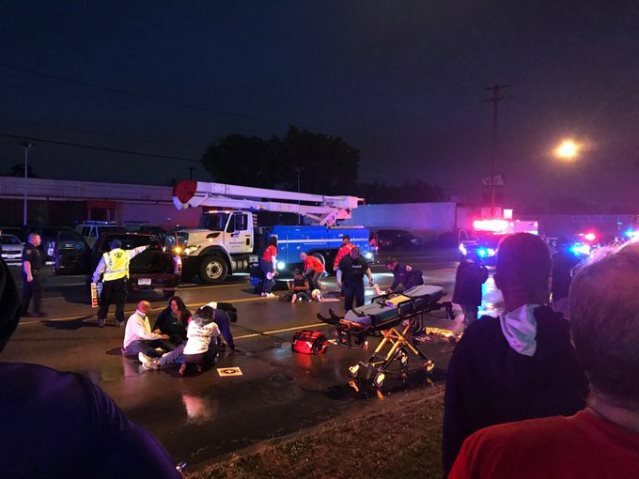 The police murder of Abdullah Abdul Muhliman, a/k/a Detric Driver, brought to mind a horrific history of virtually identical multi-agency raids resulting in the murders of #ImanLuqmanAbdullah in 2009, #AiyanaJones, 7, in 2010, and #TerranceKellom in 2015. Expert depiction of Aiyana Jones’ killing in 2010. Mr. Muhliman, also known as #DullahBeard, was subjected to the same tactics used in the murder of Aiyana Jones. A flash bang grenade was thrown into the home where he lay asleep on the couch, then police entered en masse and summarily executed him. In 2010, little Aiyana was sleeping on a couch underneath the window where the grenade was thrown. 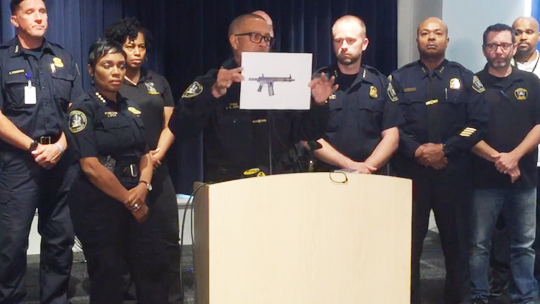 The first Detroit cop on the scene, Joseph Weekley, Jr., wielding an MP5 submachine gun, shot the child through the head seconds after her family’s unlocked door was battered down. After two mistrials, he was freed while Aiyana’s father Charles Jones and uncle Chauncey Owens were sentenced to decades in prison based on the questionable testimony of jailhouse snitches. 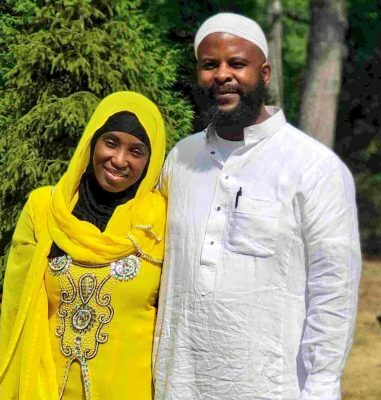 #DullahBeard was a follower of Imam Luqman Abdullah, leader of a mosque in Detroit’s Black community in a poor west side neighborhood, according to recent reports. 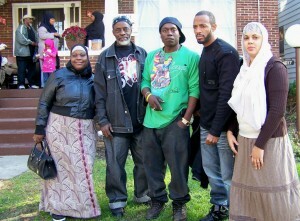 Imam Abdullah was assassinated in 2009 during a sting operation by the FBI, and police from Detroit and Dearborn. He was shot 21 times after he defended himself from a police dog which had been let loose to bite him. #DullahBeard was among the Masjif El-Haqq mosque members the FBI indicted on trumped-up charges, based largely on hearsay accounts by confidential informants who had infiltrated the group. The indictment cited alleged conversations with mosque members, not actual criminal activities. The FBI investigation was linked to the group’s ties with Imam Jamil El-Amin (formerly H. Rap Brown), both of them peaceful organizers of Black youth and families in their poverty-stricken communities. Similar FBI stings were conducted against groups of Black men in Florida and New York during the same time period. Terrance Kellom, 19, had one child and a second on the way. He and his father Kevin Kellom had been observed going to the store by the raid team before they launched the assault on his father’s home on Evergreen in Detroit, close to the same neighborhood where Dullah Beard was killed. Kevin Kellom holds granddaughter Terranae Kellom, born after her father Terrance’s murder, as Terrance’s son Terrance Desmond Kellom looks on. There was admittedly a warrant out for the young man’s arrest, which could have easily been carried out on the street. However, the raid team chose to flex their might by bursting into the Kellom home, forcing the young man down the stairs from an upstairs bedroom, and then executing him with eight shots in front of his father. They claimed he was wielding a hammer, but when Wayne County Prosecutor Kym Worthy held a press conference announcing she would not prosecute his killers, she admitted that no fingerprints were found on the hammer. Detroit Police Chief James Craig has attempted to cloak the police terror and military tactics still being visited on Detroit’s poor and Black residents by putting on a bland face and claiming a new day has dawned in police-community relations. The murder of #DullahBeard, preceded by raids on poverty-stricken neighborhoods beginning with the former Colony Arms Apartments on East Jefferson and the Martin Luther King housing complex, shows that is a blatant lie. Craig spent 28 years with the Los Angeles Police Department. He was part of an internal team that looked into crimes committed by LAPD cops in the Ramparts district, including a murder of a man in custody and frame-ups of dozens more, and whitewashed their actions. Later, however, the U.S. Justice Department put the LAPD under a consent decree like that the Detroit Police Department emerged from after a 10-year span. In their hunt for a baby killer last week, Detroit police raided a west side home before dawn. A stun grenade was thrown into the house to disorient occupants. Then police breached the front door. The dead man, Abdullah Abdul Muhiman, [#JusticeforDullahBeard] was not the suspect in the killing of a five-year-old girl hours earlier. He was an innocent man who had the unfortunate luck to be sleeping on the couch. To make a bad scene worse, the suspected gunman the police were looking for was miles away. “If you point a gun at officers, it doesn’t matter whether you’re a suspect in any other case,” he said. According to Craig’s version, Muhiman leveled an AR-15 pistol-grip semi-automatic at the officers from the sofa cushions. In response, the raid team’s point man fired several shots, killing Muhiman. Craig said his review of body cam footage could not confirm the gun-pointing scenario, since it was too dark. A gun was recovered next to Muhiman’s corpse, police say. Muhiman’s people are not buying it. Detroit police with direct knowledge of last weeks events call it a spectacular lapse in police tactics. A woman who is a suspected accomplice in the child-killing was arrested at the house during the raid. And the man suspected of actually shooting the child (he also shot the girl’s mother 16 times) was arrested later in the afternoon, miles away, near the scene of the child’s murder. Both have since been released from custody, due to lack of evidence. 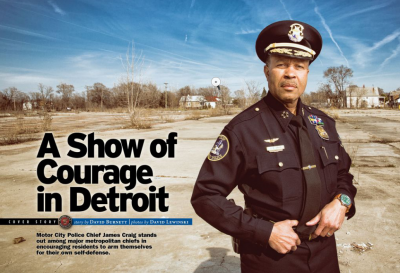 DPD Chief James Craig on cover of NRA magazine in June, 2014 after he urged Detroit homeowners to arm themselves. Remember, Craig is the man who showed up on the cover of an NRA magazine encouraging Detroiters to purchase firearms to protect their homes. It is also worth remembering that it is not uncommon for crime crews to pose as police officers before busting into homes. It is also worth remembering that Muhiman’s shooting death is the latest in a string of embarrassing, violent or deadly episodes in the police department in recent months, episodes that Craig has promised to provide answers to, but has failed to do so. Remember, the police commander moonlighting as a security guard and beating a party goer into a coma; two undercover police units pointing guns at each other and fist fighting on a porch, and the death of an on-duty officer driving in excess of 100 miles an hour on city streets to name a few. The use of force by police officers is a major issue in American life. In Detroit, it seems, not so much. But the public here, like anywhere else, deserves answers and justice demands them. The men whose photos surround that of Charles K.K. Lewis are among many Michigan lifers who have recently been exonerated or had their convictions overturned and remanded for retrial, in an unprecedented surge uncovering multiple abuses in the criminal justice system. 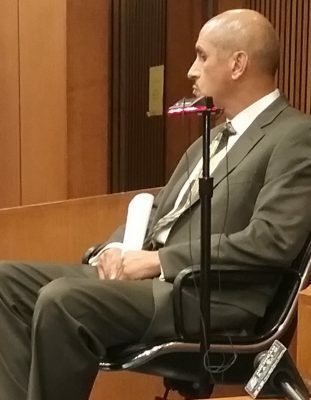 Mubarez Ahmed, granted a new trial after 15 years due to the intervention of the Michigan Innocence Clinic, speaks out for the dozens of innocent prisoners he left behind. Private investigator Scott Lewis estimates at least 30 percent of Michigan prisoners are innocent. DETROIT – Atty. Sanford Schulman of the Federal Defenders’ Office will present six powerful motions calling for the immediate release of Charles (K.K.) Lewis, in prison for 42 years since the age of 17, at a hearing next Friday, Sept. 28 at 9 a.m. in front of Judge Qiana Lillard. The hearing is the 35th in a grueling series comprising his juvenile lifer “re-sentencing,” which began in March, 2016. “I am finally happy and confident that I have an attorney who will fight effectively for me,” Lewis says of Schulman. Lewis stands at the forefront of 247 Michigan juvenile lifers, two-thirds of the state’s total, for whom prosecutors have re-recommended LWOP. Their stance violates two U.S. Supreme Court rulings which held that”only the rarest child” should be sent to die in prison. Most of the Michigan 247 have yet to see a judge. Lewis’ case is unique on many counts, including the complete loss of his official court record and Register of Actions, his claim of “actual innocence,” his challenge to the prosecutor’s request to re-sentence him to LWOP, and his request for bond since he has been without an actual sentence for over 6 years. Atty. Schulman is contesting Judge Lillard’s authority to “re-construct” and certify Lewis’ entire court file, five boxes of which mysteriously went “missing” sometime around 2012. On Nov. 11, 2016, Judge Lillard ordered the prosecution, defense, and Clerk’s Office to pool all their records, refusing to obey key U.S. and Michigan Supreme Court rulings that the loss of the case file, even in part, must result in dismissal and remand for a new trial. It remains to be seen if Judge Lillard will certify the incomplete record that resulted. 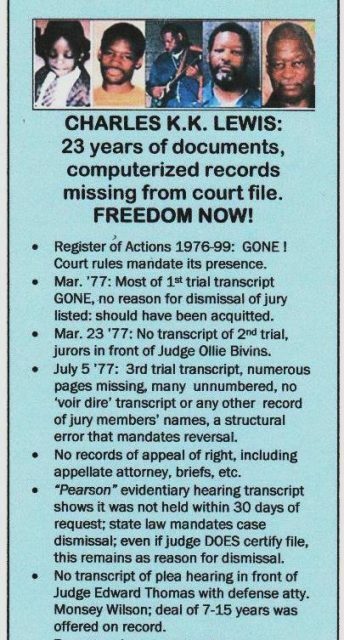 Lewis’ Register of Actions has likewise been wiped out from 1976 to 1999, including an attachment listing actions taken in Detroit Recorder’s Court prior to 1999. It currently says he was convicted on April 3, 2000 in front of Judge Gershwin Drain. Thus there is no way to determine what records should be included in a complete file. Additionally, there is no way to determine what judge he should be in front of for re-sentencing. Schulman writes, “Where the trial court’s files and records are missing, lost or have been destroyed and as such the court cannot comply with the U.S. Supreme Court’s order remanding this case for resentencing, this court should dismiss the case and order the defendant immediately released on the basis that to otherwise proceed to resentencing without a complete court file would result in a violation of the due process of law and a fundamental miscarriage of justice (US Const. Amends. VI and XIV).” Read entire motion at http://voiceofdetroit.net/wp-content/uploads/lewis.charles.mtn_.5.dismiss.file-1.pdf. “I estimate that at least 20 percent of juvenile lifers in Michigan are actually innocent,” Lewis says. He and his family have always maintained he was framed up for the murder of a white off-duty Detroit police officer in 1976. Extensive research done by the Voice of Detroit over the last three years confirms this claim. However, Lewis points to U.S. Justice Stephen Breyer’s and Justice Sonya Sotomayor’s concurring opinion in Miller/Jackson v. Alabama (USSC 2012), the Court’s first opinion outlawing mandatory juvenile life without parole. Charles Lewis shortly after his incarceration in 1977, with his mother Rosie Lewis. Lewis’ hearing Sept. 28 comes at a time when releases of wrongfully convicted individuals, many of whose cases date back decades, are hitting record highs. 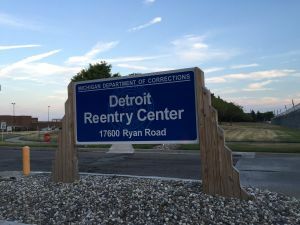 Since 2003, according to the National Registry of Exonerations, there have been 72 exonerations in Michigan, with a record of 14 last year alone. This year, four prisoners have been completely exonerated, while at least three others have been granted new trials. One, Thelonious “Shawn” Searcy, is waiting in the wings for his judge’s ruling after an evidentiary hearing that exposed deep levels of corruption and deceit among prosecutors and police. The number of exonerations and dismissals exposes what has been a deeply flawed and corrupt judicial system in Wayne County for decades, going back to the convictions and sentencing of Richard Phillips in 1971 and of Lewis in 1976 and continuing to the present day, as in the case of Thelonious “Shawn” Searcy, where Vincent Smothers testified earlier this year that he, not Searcy, committed the murder in question, and lies to the jury about ballistics evidence were exposed. It was Lewis’ current judge, Qiana Lillard, who ordered the release of Bernard Young in December, 2017. Young was incarcerated for 27 years, most recently in the Lakeland Correctional Facility in Coldwater, MI, where Lewis is currently incarcerated. Schulman refers to a stunning opinion dated Aug. 16, 2006 in which Thomas says she “thoroughly” reviewed the full transcript of Lewis’ first trial held in March, 1977, the last time any judge appears to have read that transcript. She said there was no record of Judge Joseph Maher’s reason for dismissal of the trial jury, which should have meant an acquittal, with no new trial because of the double jeopardy standard. She said she found it difficult to believe the first jury ignored the testimony of the officer’s partner and numerous eyewitnesses to the murder, who said another man driving a white Lincoln Mark IV shot Officer Gerald Sypitkowski, and chose instead to believe the testimony of three juveniles who said they were with Lewis when he killed Sypitkowski. 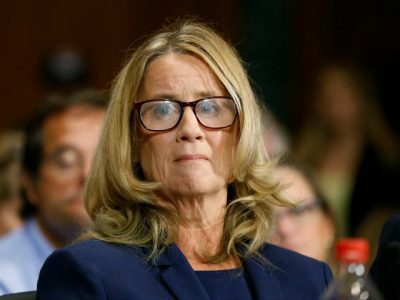 She said the juveniles’ version of events was “a scientific impossibility,” and noted none of the eyewitnesses reported seeing the juveniles at the scene. None of the juveniles testified that they actually SAW Lewis shoot the officer, just that he was with them in a yellow Ford Gran Torino followed by a green Mustang. No other witnesses reported seeing such cars. The outline of this sketch was drawn in 1976 by a DPD evidence technician. 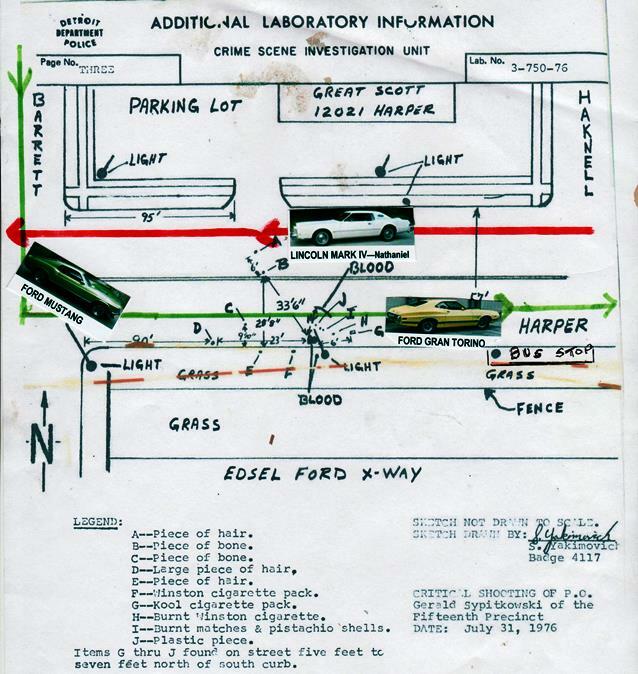 Referencing testimony at third trial, VOD has added a RED LINE with a white Lincoln Mark IV, driven by Leslie Nathanial, going west on Harper, then crossing Barrett. Eyewitnesses said they saw three Black men in the front seat. The medical examiner Werner Spitz testified the source of the gunfire could have been as much as 7 feet away from victim, although the actual shotgun was never found or tested, and no firearms expert testified. The GREEN LINE shows the route juveniles said they took, driving south down Barrett and left to go east on Harper. They said Officer Sypitkowski was killed at bus stop, but did not actually SEE Lewis shoot him. No other witnesses saw the juveniles or the two cars at the scene. Most, including the officer’s partner, who was closest to him, said there were no other cars present. Sypitkowski’s partner and multiple eyewitnesses were walking toward officer from OTY’S BAR AT 11903 HARPER, close to the intersection, when they saw gunfire from the Lincoln Mark IV and Sypitkowski fall mortally wounded in center of area marked with blood, etc. To read Atty. Schulman’s complete motion, go to http://voiceofdetroit.net/wp-content/uploads/lewis.charles.mtn_.6.dismiss.actual.innocence.pdf. 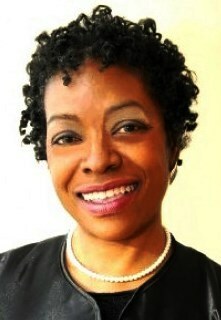 To read Judge Deborah Thomas’ opinion, go to http://voiceofdetroit.net/wp-content/uploads/Judge-Deborah-Thomas-2006-opinion.pdf. Atty. 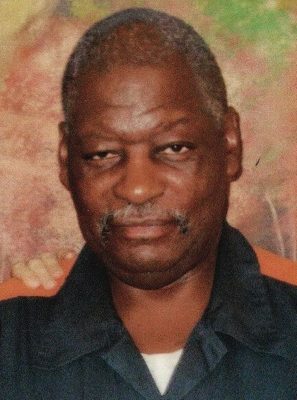 Schulman writes that Third Circuit Court Judge Edward Ewell Jr. first granted Lewis’ re-sentencing on Oct. 17, 2012, pursuant to the 2012 U.S. Supreme Court’s Miller/Jackson v. Alabama declaring mandatory juvenile life without parole unconstitutional. The U.S. Supreme Court later confirmed this was a valid re-sentencing date under Miller/Jackson and remanded the case to the Michigan Supreme Court to comply. Lewis says that his case WAS originally set for a hearing in front of Judge Chylinski by the judge, but that Asst. Criminal Court Clerk David Baxter (now retired) unilaterally and illegally refused to have Lewis writted out for the hearing, instead giving his case to Judge Lillard. It was under Baxter’s supervision that Lewis’ court file went missing. Cortez Davis El, now VOD staff writer. 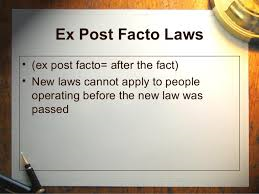 Schulman goes on to argue that Williams’ motion violated ex post facto laws because MCLA 769,25 was not passed until 2014, so it should not have applied to Lewis. Other juvenile lifers including Cortez Davis, whose trial judge Vera Massey-Jones ordered his re-sentencing in 2012 have raised the ex post facto issue as well. Davis was re-sentenced to a term of years and is now free, but his attorney Clinton Hubbell still appealed the re-sentencing. Hubbell had moved to have Davis sentenced to the original term of 10-40 years Judge Massey-Jones wanted in 1994, declaring long before the U.S. Supreme Court rulings against juvenile life without parole that she did not believe in throwing away the lives of children. Davis was 15 when he was convicted. Wayne County Prosecutor Kym Worthy used boiler plate motions like Lewis’ to ask that 67 Wayne County juvenile lifers die in prison, 97 percent of them Black. No reasons to set them aside from other juvenile lifers who were recommended for a term of years were cited. From discussions VOD has conducted with other juvenile lifers, they were evidently selected with the concurrence of attorneys from the State Appellate Defenders’ Office (SADO). 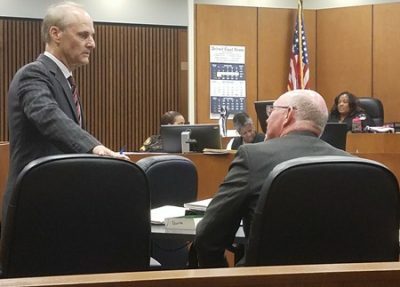 In at least one case, that of Jenard Sharp, attorneys from the Michigan ACLU and a New York law firm have also contested the lack of specifics in the prosecutor’s sentencing memorandum. Sharp is charged with “felony murder,” meaning he did not actually kill anyone. Many juvenile lifers who were actually the shooters received recommendations for terms of years (not to say they should have received LWOP recommendations, which are reserved for only the “rarest” child). THE DEFENDANT WAS DENIED HIS CONSTITUTIONAL RIGHT TO THE EFFECTIVE ASSISTANCE OF TRIAL COUNSEL GUARANTEED BY THE SIXTH AND FOURTEENTH AMENDMENTS OF THE US CONSTITUTION, WHERE DEFENSE COUNSEL ARGUED TO THE JURY THAT THE DEFENDANT WAS GUILTY. In this motion, Atty. Schulman cites the appalling opening statement of Lewis’ court-appointed attorney M. Arthur Arduin, Jr. (family name Arduino), known to have ties with Detroit mob figures. Arduin was also previously a campaign manager for Judge Thomas Poindexter, head of the Greater Detroit Area Homeowners’ Council which campaigned to keep Blacks out of white neighborhoods during the volatile era of the ’60’s and ’70.s. 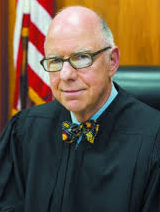 Judge Thomas Poindexter wanted Blacks kept out of white neighborhoods. Arduin: “There’s been a killing; there’s been an attempted robbery; there’s been a attempted robbery prior to this matter at issue today. Now we have here only one Defendant. But originally there were four young blacks. If they are part of a gang, I don’t know. But let’s assume they’re part of a gang. . . . .We’ re going to prove four lads who are part of a gang who are — who are expertise. Expertise, -they knew how to steal cars and God only knows if they knew how to rob. Now that’s what we’re going to prove. And they started out on this day, July 31st, four of them — four of them — to steal a car and to go out and commit a robbery. And they took with them the tools of their trade. “The Defendant’s trial attorney was grossly ineffective,” Atty. Schulman argued. 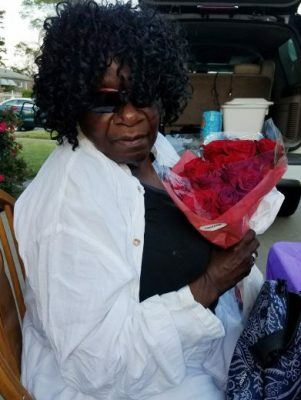 “Arthur Arduin refused to tell the jury that off duty Detroit Police Officer, Dennis Van Fleteren testified that he was talking to the deceased when Leslie Nathaniel pulled up next to the deceased and shot and killed him. The result would have been different if Arduin had argued to the jury that eye witnesses identified Leslie Nathaniel as the killer. Lewis’ previous attorney brought a motion for bond that she did not support with the proper legal precedents given her by Lewis, who has become a highly proficient jailhouse lawyer and worked directly with Atty. Schulman in drafting the current motions. AP Thomas Dawson’s response at the time was basically to laugh it off, pointing to Lewis’ record of disciplinary actions while incarcerated, most of them minor for “being out of place” in the law library, where he now works at the Lakeland Correctional Facility. AP Thomas Dawson and AP Jason Williams share a laugh during one of Lewis’ hearings. Dawson did not consider the state of mind and the anger that Lewis must have experienced on entrance to the MDOC , knowing that he was innocent of the first-degree murder charges, and expecting he would never see freedom again. But he immediately set about to learn the law that had imprisoned him unjustly and to use it to help himself and others get free. He took a paralegal course along with many others to educate himself. He has also honed his musical skills, leading prison bands which play jazz, R&B, rock, and rap during the last four decades. Atty. 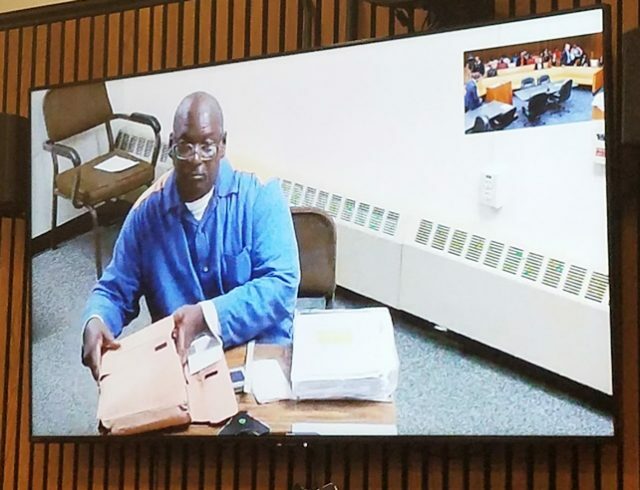 Schulman has presented powerful arguments calling for his innocent client to receive a bond, just as Judge Lillard granted to falsely convicted Bernard Young in the video above. ”The Defendant is currently being held in prison illegally,” Schulman states. “The Defendant’s first jury was dismissed sua sponte by Judge Joseph E. Maher on March 22, 1977. All subsequent Legal proceedings held after March 22, 1977 were double jeopardy barred by People v Benton, 402 Mich 47 (1979). “ On August 22, 1980 the Michigan Court of Appeals granted the Defendant a Pearson evidentiary hearing pursuant to People v Pearson, 404 Mich 698 (1979). Pursuant to Pearson the prosecution had 30 days to conduct a Pearson evidentiary hearing or the conviction was automatically vacated. The prosecution’s 30 days began on August 22, 1980 and ended September 22, 1980 with no Pearson evidentiary hearing. The Defendant’s conviction should have been automatically vacated on September 23, 1980. 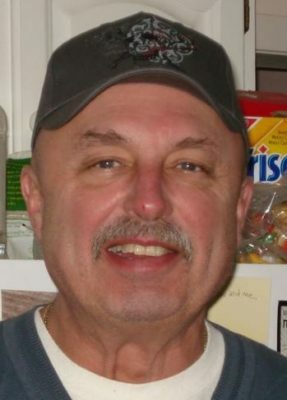 Wayne County Deputy Court Clerk David Baxter had control of files, Register of Actions, which disappeared. “Judge Lillard did not have the power or authority to order Thomas Dawson, assistant Wayne County Prosecutor or David Baxter Deputy Wayne County Clerk to reconstruct the defendant’s criminal file. . . .It is one of the necessary and fundamental rules of law that the judicial power cannot interfere with the legitimate discretion of any other department of government. So long as they do no illegal act, and are doing business in the range of the powers committed to their exercise, no outside authority can intermeddle with them; and, unless the action complained of was beyond the legal discretion of the city, the circuit court had no jurisdiction to grant the injunction which was allowed. Lewis says that when he goes to Jackson Prison’s medical clinic for treatment of macular degeneration of his eye, the guards there cannot figure out whether they should even handcuff him because they can find no record of a current sentence. The disease in his eye is an effect of the severe diabetes he contracted after being incarcerated. Lewis has also had three heart attacks during his incarceration. After the last one, the MDOC denied him surgery for a stent. 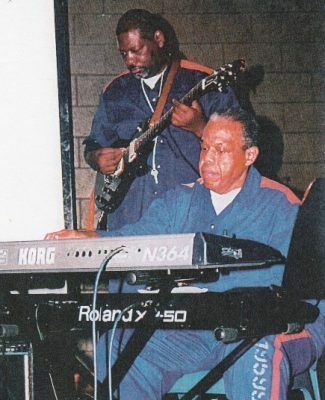 Charles Lewis, now 59, on guitar, Bill Lemons, now 74, on keyboard, both noted musicians, play in prison band. But he says he is determined that he will come home, and that since 42 years of his life has been stolen from him, he hopes that his battles and the research attendant on them will assist the prisoners who come after him. He says he is seeing more and more young men, products of the school-to-prison pipeline, enter MDOC, to swell the ranks of mass incarceration in the U.S.
Lewis says Lakeland is a prison where the MDOC sends individuals to die, and that about 50 prisoners die there annually. He still remembers many who died who were good friends of his, but he refuses to follow in their stead. “Well, they had a bad day, but I’m still here,” he jokes drily. Aside from being a world-class musician who can play nearly every instrument and regularly organizes concerts for his fellow prisoners, Lewis wants to be a stand-up comic when he comes home. Atty. Schulman has also re-filed Lewis’ pro se motion objecting to Judge Lillard’s order to reconstruct his file, which raises multiple U.S. and Michigan Supreme Court rulings that the loss of an official court file, even in part, means the conviction and sentence must be vacated and remanded for a new trial. Joanna Underwood rallies up the crowd against long-term poisoning of Detroit’s children. 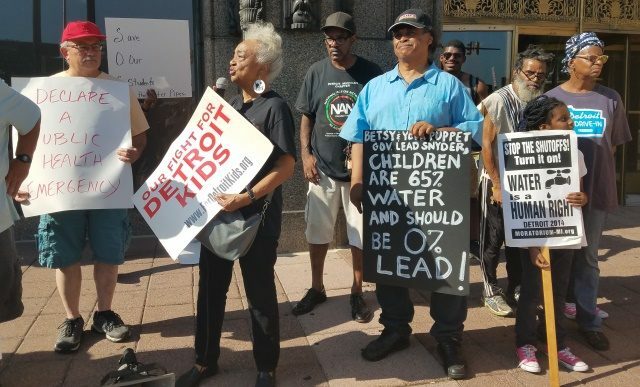 A coalition of organizations held an impassioned protest outside the headquarters of the Detroit Public Schools “Community District” Tues. Sept. 4, the first day of the school year. School officials had just announced that water would be shut off to all DPS schools due to high levels of lead and copper, although they knew of the contamination weeks before the schools opened. Schoolchildren also sweltered during a heat wave that lasted into the next day, Sept. 5, experiencing temperatures that approached 100 degrees. Protesters wanted to know why the schools of Detroit are not air-conditioned like the offices of Mayor Mike Duggan, Dan Gilbert, and the corporatocracy that rules Detroit. THEY CALLED FOR AN IMMEDIATE SHUTDOWN OF DPSCD SCHOOLS DUE TO A HEALTH EMERGENCY. Helen Moore, leader of Keep the Vote No Takeover, addresses rally. DETROIT — Furious Detroiters demonstrated outside the headquarters of the Detroit Public Schools “Community District” Sept. 4, the first day of the new school year, reacting to Superintendent Nikolai Vitti’s announcement that water to 106 schools and nearly 50,000 students left in the devastated district will be shut off indefinitely. Results from initial tests in 34 schools showed elevated lead and copper levels, Vitti said. The tests were performed in the spring, but Vitti waited until Aug. 30 to make his announcement about shutting DPSCD water off. He claimed he wanted to err on the side of caution by shutting down water to all schools. Vitti claimed The Environmental Protection Agency ceiling for lead in drinking water is 15 parts per billion, and for copper, 1.3 parts per million. He told reporters the district used those levels to identify problem spots. 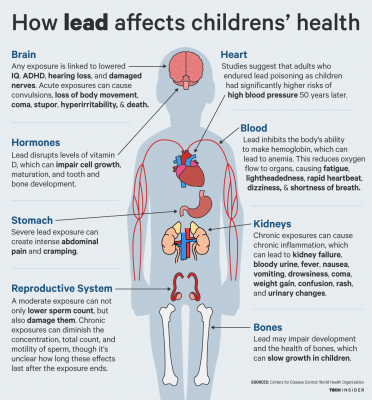 The EPA says the presence of lead comes from both household plumbing systems as well as “erosion of natural deposits” and from water lines coming into households and other buildings from the supplier. 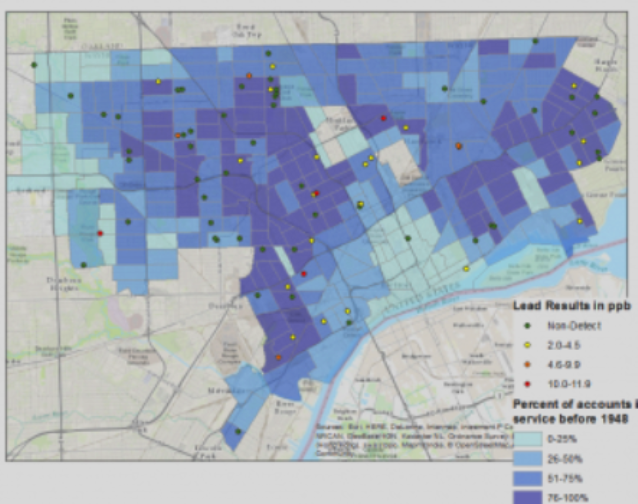 DWSD chart showing lead in Detroit household water in 2016. Red dots indicate highest levels, 10.0-11.0. However, the last Water Quality Report for DWSD, published in 2017, said “The sampling results show that all the homes tested had lead levels below the EPA action level, which is 15 parts per billion (ppb). The MDEQ certified that DWSD’s 90th percentile for lead was 4 ppb, well below the EPA action level.” (See http://voiceofdetroit.net/wp-content/uploads/GreatLakesWater-2017WaterReport.pdf). Former Wastewater Plant workers including Bill Davis, a supervisor, told VOD earlier that previous “boil water alerts” and flooding in the City of Detroit, along with increased contamination of Lake Erie and other bodies of water, was caused by continuing layoffs of qualified staff, and the release of toxic elements including sewage into lakes and homes in the six-county area governed by DWSD. More than 41 percent of DWSD workers were laid off before the creation of the Great Lakes Water Authority, and the management of the Wastewater Treatment Plant was turned over to a notorious privatizer, the EMA, which earlier caused record flooding in Toronto. Most recently, VOD was informed by Dr. Saulius Simoliunas, a longtime senior chemist at DWSD, that he and other chemists who sat on the board of the Senior Chemists and Technicians Association (SCATA) were singled out for lay-offs in 2015, because of their militant demands that the department adhere to strict guidelines regarding wastewater discharge. SCATA filed a complaint with the Michigan Employment Relations Commission, which was dismissed outright in 2017. Dr. Simoliunas is well-known around the U.S., meeting with different associations charged with safeguarding the quality of water nationally. 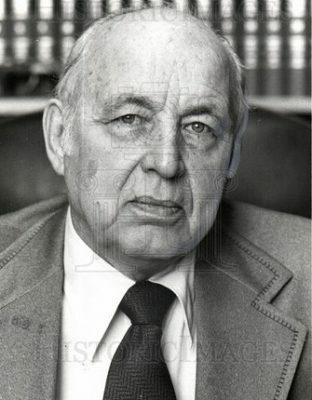 Freman Hendrix was the first chairman of the Detroit Board of Education after the state takeover in 1999, which began the long destruction of the original DPS. 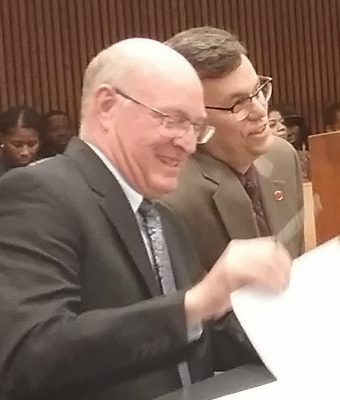 Gary Brown sat with convicted child molester Charles Pugh on the DWSD “Roots Cause Committee” which caused havoc with its recommendations for drastic staff cutbacks and other atrocities. The lay-offs occurred during the turbulent period prior to the GLWA takeover of DWSD, when skilled classifications were being combined and often eliminated, then filled with unqualified workers. 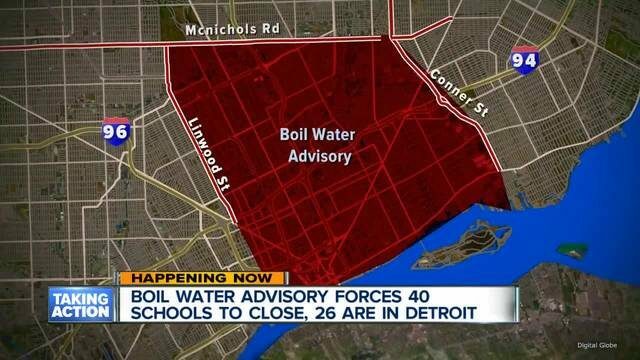 Although the Simoliunas complaint related to the Wastewater Treatment Plant, a boil water advisory was issued for a wide swath of Detroit’s east side after employees failed to identify a malfunction in the Water Treatment Plant on E. Jefferson and Cadillac, and numerous other occasions of putrid water and sewage released into homes have happened, as VOD outlined in its 2017 story, http://voiceofdetroit.net/2017/03/08/do-not-drink-the-water-no-qualified-testers-in-detroit-glwa-crises-cause-ongoing-contamination/. Both the GLWA, the DWSD and the DPSCD have therefore been caught up in monstrous lies that endanger the health of Detroit’s children, similar to the lead contamination of the entire city of Flint. 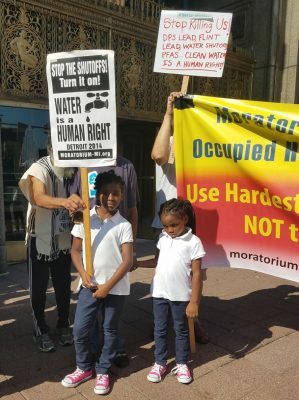 DPS children turned out to protest water shut-off. There, Michigan Governor Rick Snyder’s Emergency Manager decided to separate Flint from the DWSD water system in anticipation of the construction of a duplicate pipeline (the Karegnondi Water Authority) which was way behind schedule. Meanwhile, Flint’s EM decided to use Flint River water instead of Great Lakes water (which had been used by the DWSD), but treat it with Flint’s temporary treatment plant, only to be used in emergencies for period of no more than two weeks. As time dragged on, the entire city became contaminated, but the chief instigators, Snyder, the EM, and Jeff Wright of the Karegnondi Water Authority, have not yet gone to jail. 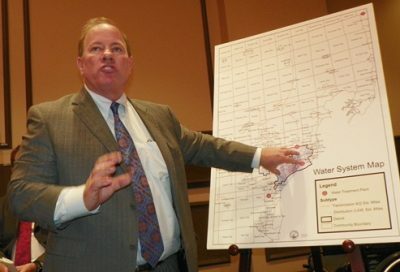 See: http://voiceofdetroit.net/2016/02/15/bi-partisan-deal-led-to-flint-water-poisoning-for-profit-the-karegnondi-water-authority-kwa/. Please read and share the following message I received as a DPSCD staff member, from Superintendent Dr. Vitti, regarding upcoming meetings related to water quality and shutoffs in our schools. Please share widely in your networks so we can be more well informed and diligent as a community. To provide everyone in the district and the greater community to receive more information about the water situation in our schools and ask questions, we will conduct four engagement sessions in September from 4:30 p.m. to 5:30 p.m. at the locations below. 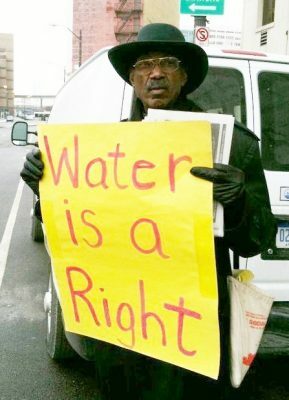 In the meantime, please visit our website on the water topic at http://detroitk12.org/content/drinking-water/ where we have included a thorough FAQ document that should address the majority of questions and concerns that you may have. This is also the site where final water results from each school will be posted. Please note that the only topic that will be discussed at the meetings is DPSCD water in schools. Questions or comments related to other topics will not be addressed at the meetings. 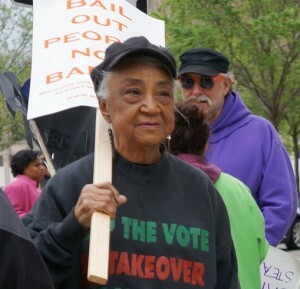 Helen Moore, long-time leader of Keep the Vote No Takeover and her organization sponsored a meeting just after the Sept. 4 rally. VOD was not able to attend. Please contact Elder Moore for updates on planned actions at 313-934-7721 or helen-moore@att.net. Other contacts: Call 319-0870 for updates from the Moratorium NOW! Coalition. Marchers occupy Michigan Avenue in Lansing, MI to support the demands of prisoners striking across the U.S., Canada, and Palestine. 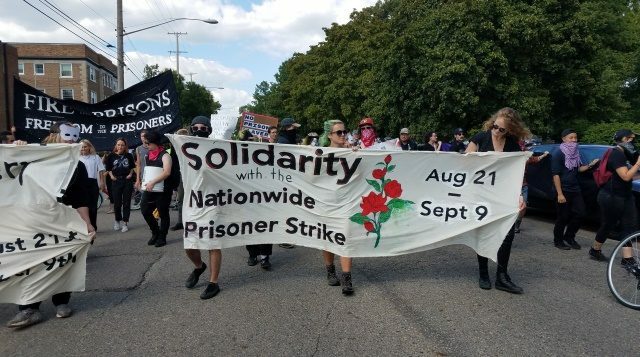 Lansing, MI – More than 100 people took the streets in Lansing Aug. 23 to support the national prisoner’s strike taking place from Aug. 21 to Sept. 9, called by a coalition of prisoners and their organizations. The march began with a rally in Durant Park and blocked Michigan Avenue for miles afterwards, proceeding past City Hall, where speakers addressed the crowd, and then to the Michigan Department of Corrections headquarters, where organizers posted placards supporting the prison strike on its doors. Michigan Avenue rang with chants of “No Mass Incarceration, We Don’t Want a Prison Nation,” “Fire to the Prisons, Free all the Prisoners,” and “Brick by Brick, Wall by Wall, We Will Make the Prisons Fall,” as drums and noisemakers sounded. Drivers of many cars honked their horns in solidarity, although they were temporarily blocked by the march. Video above: Alejo Stark, a PhD candidate at U-M, and spokesperson for Michigan Abolition and Prison Solidarity summarizes goals of rally. Since 2004, Detroit has virtually demolished its entire public education system, once considered world-class and high-achieving. The majority of youth in Detroit now attend non-accountable charter schools, many of them for-profit. Most have inferior curriculae, not including music, band, athletics, social workers, libraries, and many other programs that made the schools unifying anchors for communities. Southwestern High School, now closed and devastated, as are many other once proud public schools in Detroit. The devastation of education for Detroit’s majority-Black youth has created despair, involvement in crime to support families, and killings throughout the city’s neighborhoods tied to the drug trade and a lack of direction for the youth. Dennis Boatwright spent 24 years in the Michigan prison system and now devotes his time to raising public awareness and organizing to abolish the prison system, a demand that many young people raised after the historic Attica Rebellion in September, 1971. 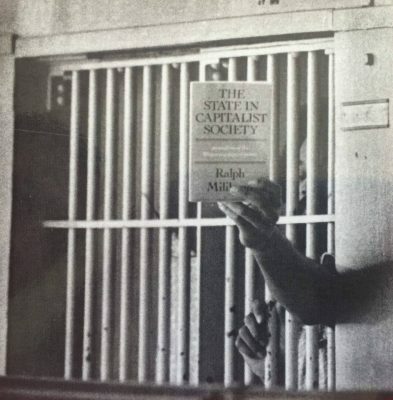 Then, they chanted, “Tear Down the Walls,” and “Prisons are Concentration Camps for the Poor.” The Attica Rebellion gave birth to other uprisings in prisons across the country, and a new consciousness about a country that has five percent of the world’s population, but 25 percent of its incarcerated population. Dennis Boatwright spent 24 years in the Michigan prison system and now devotes his time to raising public awareness and organizing to abolish the prison system, a demand that many young people raised after the historic Attica Rebellion in September, 1971. 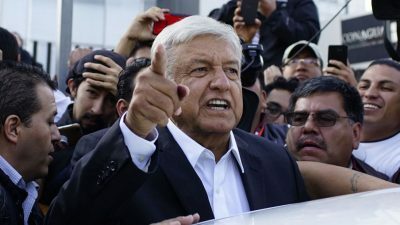 Then, they chanted, “Tear Down the Walls,” and “Prisons are Concentration Camps for the Poor.” The Attica Rebellion gave birth to other uprisings in prisons across the country, and a new consciousness about a country that has five percent of the world’s population, but 25 percent of its incarcerated population, at least 70 percent of whom are Black and Latino. They are treated worse than animals. 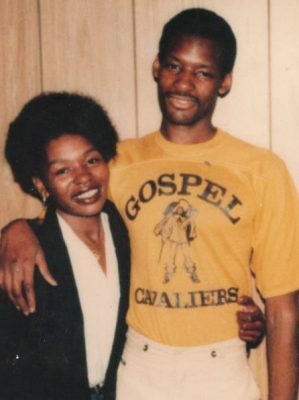 Ricardo Ferrell, 60, in prison since 1982. 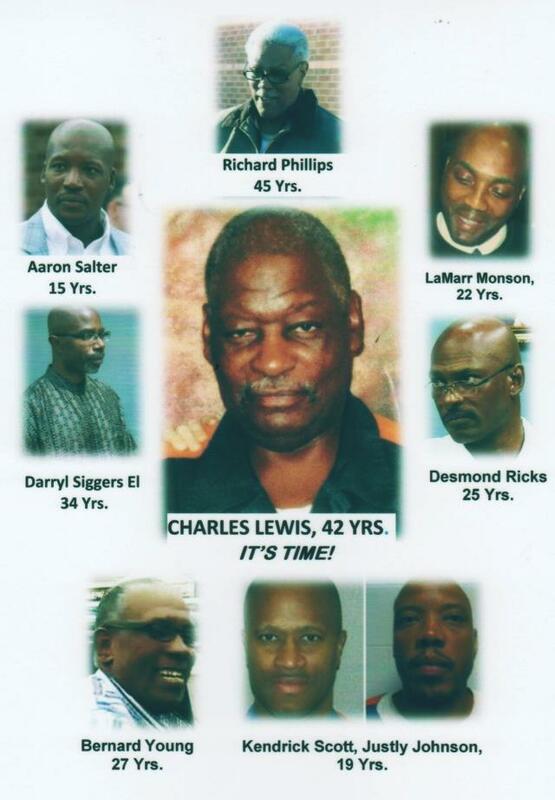 Charles Lewis, 59, in prison since 1976. MDOC prisoner Ricardo Ferrell quoted Kate Cox of the Osborne National and Burden Association in a recent article addressing the aging population of prisoners in the U.S.
Charles Lewis, 59, who has been wrongfully incarcerated for 42 years in the MDOC, frequently lists the names of men he has befriended who died far earlier than expected due to the horrible medical care and food that Michigan prisoners receive. He himself developed severe diabetes after going to prison at the age of 17, has had three heart attacks, and suffers from numerous other ailments. As a long-time prison activist herself, and now editor of the Voice of Detroit, Diane Bukowski also addressed the rally to call attention to the plight of Michigan’s 247 “juvenile lifers.” They continue to be incarcerated despite the fact that the U.S. Supreme Court ruled in Miller v. Alabama (2012) and Montgomery v. Louisiana (2016) outlawed the practice of sending children ages 17 and under to die in prison. The Michigan Supreme Court recently contravened the highest court in the U.S., claiming that judges who are re-sentencing these men and women, many of whom have spent decades in prison, do not have to specify factually whether they are the “rarest” child incapable of rehabilitation. Organizers also recalled the historic rebellion at Michigan’s Kinross Correctional Facility on Sept. 9, 2016, during which hundreds of prisoners rose up against bestial conditions and treatment. The radio broadcast below contains reports from Kinross prisoners of those events, and the severe retaliation meted out to them afterward. Another source said at least three Kinross organizers died in the aftermath; the cause of death is not known. 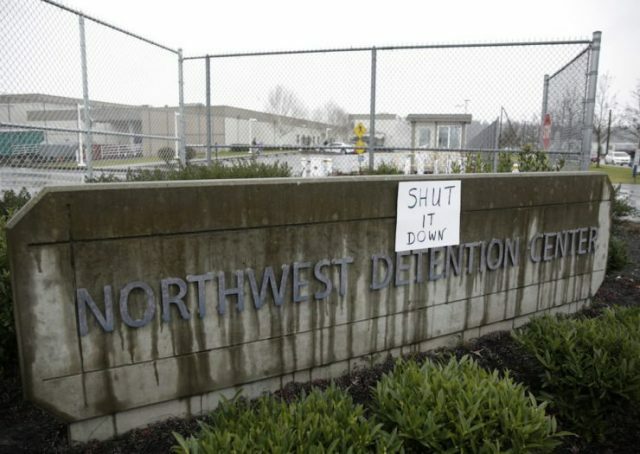 Immigrants detained in the Tacoma, Washington Northwest Detention Center have joined the national strike, whose leaders also call for the abolition of I.C.E. 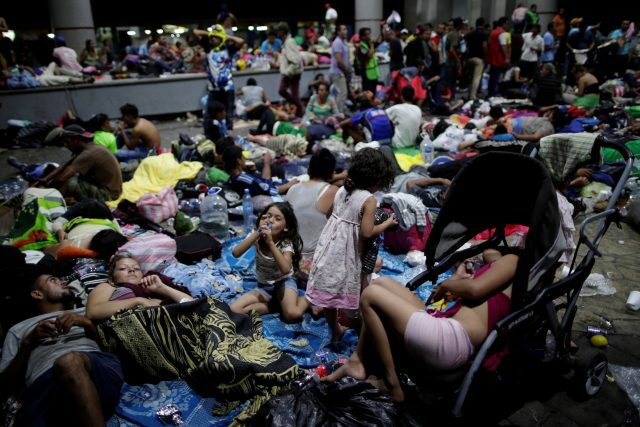 “We are acting with solidarity for all those people who are being detained wrongfully and stand together to help support all those women who have been separated from their children, and to stop all the family separations happening today for a lot of us are also being separated and we have U.S. citizen children,” immigrants participating in the hunger strike said in a handwritten letter shared on the NWDC Resistance Facebook page. One week into the national prison strike, a movement led by incarcerated people demanding an end to “prison slavery” and improvements that recognize their humanity, immigrants in detention have launched a strike of their own in solidarity. Newsweek first reported on Thursday that an estimated 60 immigrants detained by Immigration and Customs Enforcement (ICE) at the Northwest Detention Center (NWDC) in Tacoma, Washington, are participating in a hunger strike. In a statement to Newsweek, ICE initially denied the hunger strike was taking place. On Tuesday afternoon, in an emailed statement to Rewire.News, the agency confirmed that six people detained at NWDC are currently participating in a hunger strike. 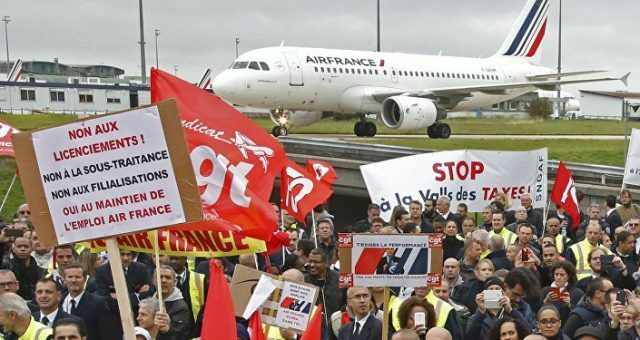 “Rumors of a widespread hunger strike are false,” the agency said. 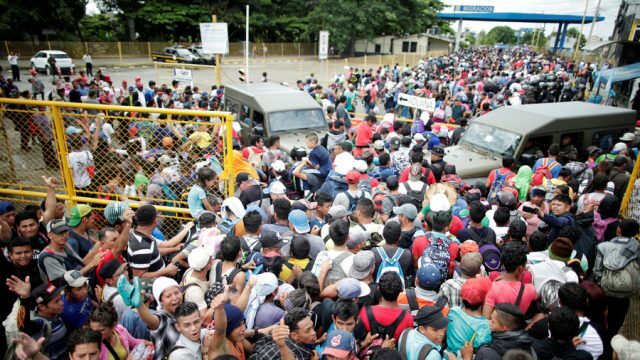 This morning, Maru Mora Villalpando, a spokesperson for the undocumented-led immigrant rights group, NWDC Resistance, told Rewire.News the number of immigrants participating in the strike is fluctuating. 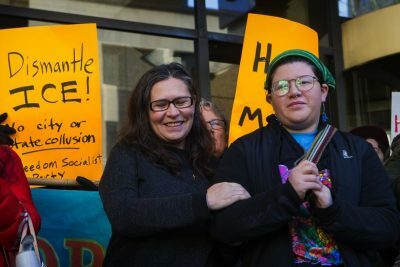 She said that she could confirm six hunger strikers at NWDC had been placed in solitary confinement by ICE and that the strike may spread to Oregon and California. 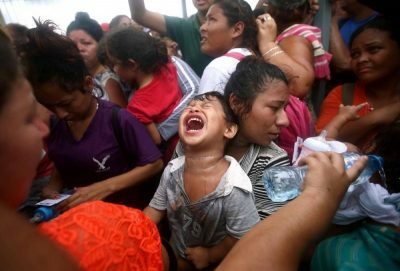 “We are acting with solidarity for all those people who are being detained wrongfully and stand together to help support all those women who have been separated from their children, and to stop all the family separations happening today for a lot of us are also being separated and we have U.S. citizen children,” the letter reads. Women in detention have told Mora Villalpando that they too would like to participate in the hunger strike, but she said, ICE has told them that if they hunger strike, they will be moved to a different facility, away from their children. ICE has a history of transferring hunger strikers to other facilities. In April 2018, Project South filed a lawsuit against the nation’s largest private prison company, CoreCivic, on behalf of Shoaib Ahmed and other immigrants detained at the Stewart Detention Center in Lumpkin, Georgia. The lawsuit alleges that the company “violates human trafficking laws and employs a deprivation scheme to force immigrants detained at Stewart to work for sub-minimum wages, and then threatens to punish them for refusing to work through solitary confinement or loss of access to necessities.” In 2014, the law firm Outten & Golden filed a similar lawsuit against the nation’s second largest private prison company, GEO Group, for engaging in similar practices at the Aurora Detention Center in Colorado, in violation the Trafficking Victims Protection Act. Currently, Mora Villalpando and other organizers with NWDC Resistance are in search of legal representation for the hunger strikers in solitary confinement, one of whom says ICE told him that if he does not eat, he will be force-fed. While ICE has previously denied it retaliates against detainees, there are documented cases of the agency moving to force-feed hunger strikers. As Rewire.News reported in December 2015, detainees at the Etowah County Detention Center in Gadsden, Alabama, ended a 14-day hunger strike after hearing that a district judge authorized officials to force-feed one of the hunger strikers at Etowah. An enslaved African is depicted being force-fed. “The idea that immigrants are being threatened with force-feeding in the United States is so wild to me, but it also isn’t. We have a history of this. 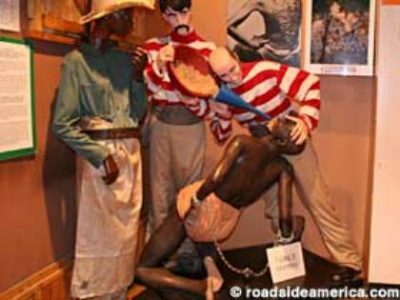 This happened during slavery,” said Kevin Steel. Steel, an organizer with the Incarcerated Workers Organizing Committee, which is led by formerly incarcerated people, is referring to the ways enslaved people were force-fed if they attempted to stop eating. Steel, who was incarcerated in New York and still remembers seeing men put their feet in toilets because their cells were so hot during summer days and the facility had no fans or air conditioning, said he understands why prisoners are striking. Protesters outside Hyde support prisoners there. The United States incarcerates the highest number of people in the world, both in absolute and relative terms. But prisoners and abolitionists are challenging the foundations of mass incarceration. Over the past decade, a wave of prison rebellions has swept the country, increasing in both frequency and intensity. 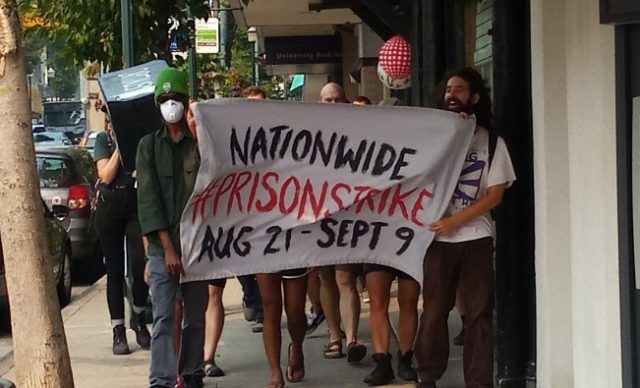 In September 2016 the largest coordinated national prisoner strike occurred in facilities around the country. These rebellions prove time and time again that caging and torturing humans is violence and will be resisted by those locked up by the system. 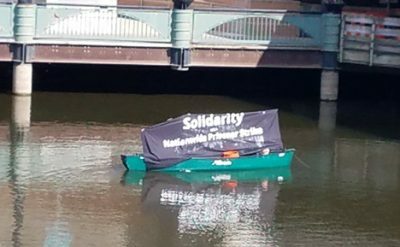 Prisoner resistance demonstrates that instead of solving the crisis of capitalism, prisons themselves are the crisis. 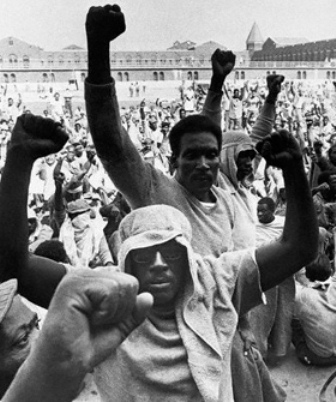 The Attica Rebellion began September 9, 1971, sparked uprisings in other prisons across the U.S. Contact a supporting local organization to see how you can be supportive. If you are unsure of who to connect with, email millionsforprisonersmarch@gmail.com. 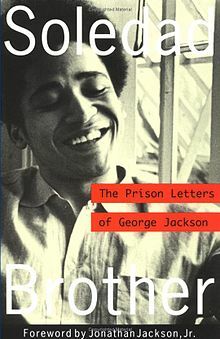 George Jackson was assassinated Aug, 21, 1971. TO MAKE PRISONS OBSOLETE, WE HAVE TO SUPPORT THE STRUGGLE OF THE FREEDOM FIGHTERS AND PRISON REBELS BEHIND BARS. The author of this release, Jailhouse Lawyers Speak, is a national collective of incarcerated people who fight for human rights by providing other incarcerated people with access to legal education, resources, and assistance. 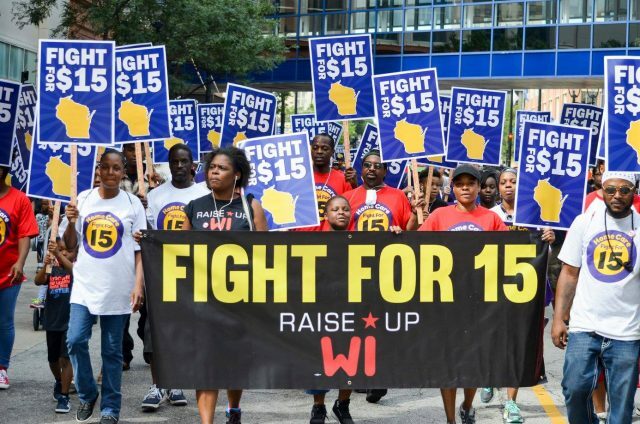 The national call to action has now been endorsed by the Incarcerated Workers Organizing Committee (IWOC) as well as various other prisoner-advocacy and abolitionist groups around the country. 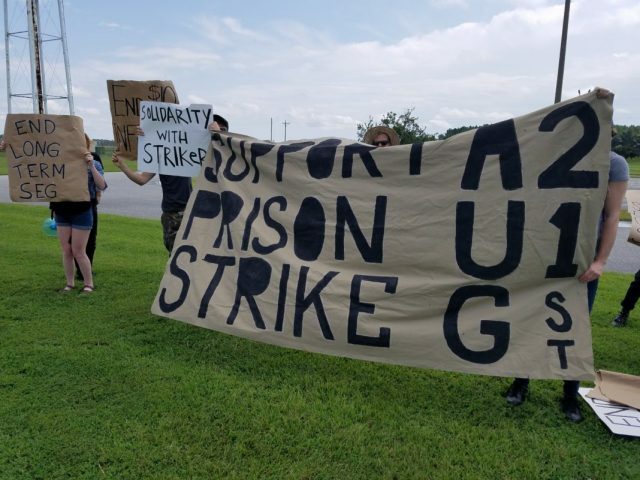 Join GEO in Lansing, MI for National Prison Strike Rally! GEO (AFT-MI Local 3550, AFL-CIO) supports the National Prisoners Strike, August 21st to September 9th, 2018. 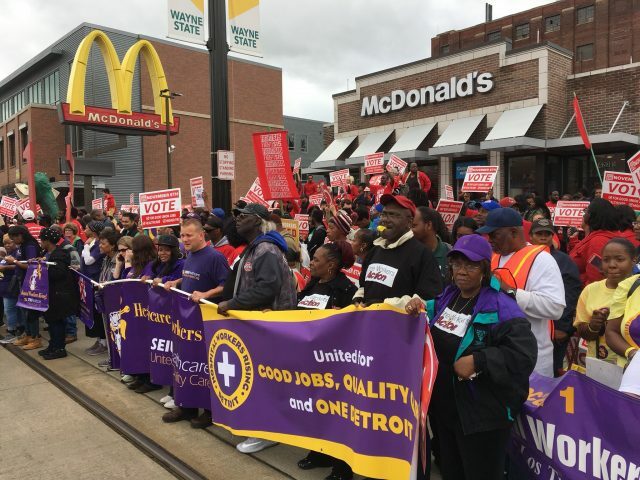 In order to draw attention to incarcerated workers’ demands, and to deter retaliation against participating prisoners, we call upon workers to join the solidarity march and rally in Lansing on Thursday, August 23rd. The nationwide strike is being called in response to the incident of violence at Lee Correctional Institution in South Carolina, April 2018, in which dozens of workers were injured and seven were killed. 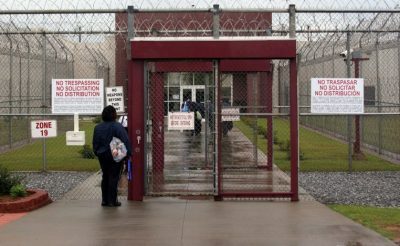 These deaths could have easily been avoided had the facility not been overcrowded; had the inmates not been subjected to hopeless and violent conditions; and had prison guards and EMTs not waited hours before intervening. In the aftermath, all Level 2 and 3 facilities in South Carolina were put on statewide lockdown, denying prisoners any freedom of movement, regular access to showers, recreation, or meals outside their cells. The strike call has also been endorsed by, amongst others, the Graduate Employees’ Organization (IFT/AFT Local 6300, AFL-CIO) of the University of Illinois at Urbana-Champaign; the Incarcerated Workers Organizing Committee (IWOC) of the Industrial Workers of the World (IWW); Jailhouse Lawyers Speak; Millions for Prisoners; The People’s Consortium. § MAPS (Michigan Abolition and Prisoner Solidarity) action page. The first of the prisoners’ 10 demands is simple: Immediate improvements to the conditions of prisons and prison policies that recognize the humanity of imprisoned men and women. Their other demands are important as well. They include a decent wage for the work they do; a restoration of Pell grants; better funding for rehabilitation services; better ways to air legal grievances; and an end to sentences without the possibility of parole, among other reforms. 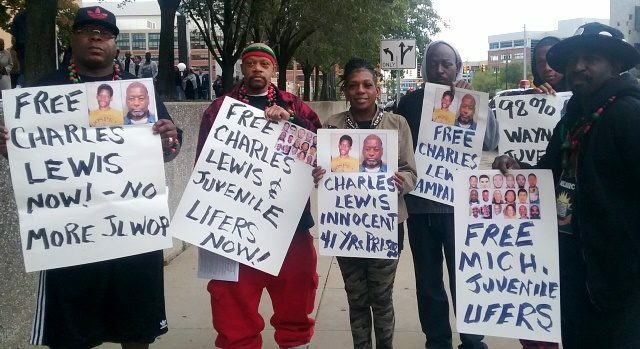 One of many marches across the U.S.
WILL CHARLES LEWIS, 247 MICHIGAN JUVENILE LIFERS DIE IN PRISON DUE TO RE-SENTENCING DELAYS, OR GO FREE? ATTEND BELLE ISLE MEETING ON GRAND PRIX FRI. JULY 13: NO PLACE FOR A CAR RACE!